Bryan Hickerson normally pitched in relief. On this night in August 1991, he showed his Giants he could start, as well, according to The Associated Press. Hickerson went seven innings without giving up a run, The AP wrote. "You can't pitch much better than that," Giants manager Roger Craig told The AP afterward of Hickerson. "He was filling in because we needed a starter, and look what he did." Hickerson first made the majors earlier that year. He went on to see the majors in four more campaigns. In all, he saw time in 209 major league games, starting 36 of them. Hickerson's career began in 1986, taken by the Twins in the seventh round of the draft out of the University of Minnesota. 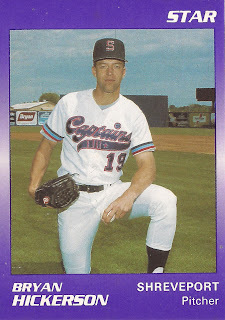 Hickerson started with the Twins at single-A Visalia as a starter. He began 11 games, going 4-3, with a 4.23 ERA. He moved to the Giants system and single-A Clinton and AA Shreveport for 1987 in the Dan Gladden trade. He missed 1988, but came back in 1989 at single-A San Jose. After going through Shreveport and AAA Phoenix in 1990, he returned to both in 1991. He also debuted in San Francisco that July. Hickerson went 2-2 for the Giants over 17 outings, six starts. He then returned to San Francisco for 1992, getting into 61 games, 60 of those outings in relief. That August, Hickerson gave up a home run to opposing pitcher Dwight Gooden after coming in early in relief. Hickerson also took the loss. "I threw Gooden a split (finger fastball) that didn't drop," Hickerson told The AP afterward. Hickerson posted a 3.09 ERA that year. He then returned to San Francisco for each of the next two seasons, getting 47 outings, 15 starts in 1993 and 28 outings, 14 starts in 1994. The Cubs took Hickerson off waivers for 1995 and he went to the Rockies mid-season in a trade. Between them, he got into 56 games in relief, with an 8.57 ERA, ending his pro career. Hickerson then started a brief coaching career. He coached 1997 at high-A Bakersfield and 1998 at high-A San Jose. In June 1998, Hickerson worked with Giants minor leaguer Luis Estrella to slow the pitcher's delivery. "He always wants the ball, which is good," Hickerson told The Los Angeles Times. "But he wants to do everything quickly, and I mean everything. He has good stuff. When he slows himself down, he can have great stuff." Every player who takes the field has his own story. With the hindsight that comes with the passage of time, those are the stories I try to tell here. The tools for this include a series of minor league baseball card sets released that summer, articles and other information available online and direct interviews. Comments or questions? Contact me via email at sacoo78@gmail.com. These are probably the coolest thing I do here, direct interviews with the players. I either catch up with them in person, or by phone. I'm a baseball fan and writer in Upstate New York, originally from Iowa. My wife and I have attended games in 24 major league parks, along with more than 30 different minor league parks. Cards from Too Many Verlanders! Pirates Series Starts Friday - Stadium Giveaways, Pregame Info, Autographs and Other Stuff! Will Gary Vaynerchuk push the sports card market to new heights? 1960s Baseball Blog | Enjoy the Memories! So, Do You Like ... Stuff? An old friend has returned. The blog name is a reference to the character Crash Davis from the all-time-great baseball movie Bull Durham and the 21 days Crash spent in the majors. They were the 21 greatest days of his life.